The Caledon Townhall Players (CTHP) had their first performance of “Angels Unawares” in June 1962 in the Old Townhall, in the Village of Caledon. Subsequently, a series of short-term leases to continue use of the building were drawn up between CTHP and the Town of Caledon, and they have been presenting live theatre productions in that venue ever since. On Feb 20th, 1985, a 20 year lease was signed, and it in turn was renewed for a further 20 years commencing Dec 31st, 2004. They celebrated their 50th Season in 2013-2014. 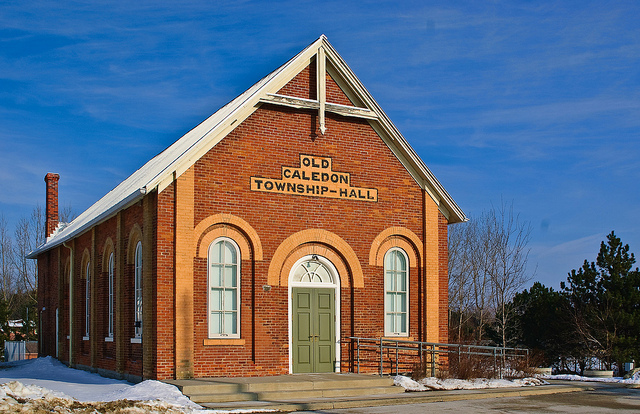 The Old Caledon Township Hall was built in the summer of 1875 to be used as a court house and hall. The building was used as a meeting place for the Church of England and Grange No. 174. It also served as a social centre and fondly remembered as the place where many dances, showers, euchres and public meetings were held. It should be noted that at that time there wasn’t any running water or washrooms! In October 1963, a new municipal office building (now known as Caledon Village Place) was officially opened in Caledon Village. The Town Council meetings were held there until the official opening of the Town offices in Caledon East in June 1976. Thus in 1963 the Old Townhall became the home of CTHP, and CTHP undertook to pay operating expenses and maintenance costs of the building. In 1976, CTHP gave notice of the intention to “file for registration of the Old Townhall as a property of historic and/or architectural interest under the Ontario Heritage Act, 1974”. Subsequent supporting correspondence mentioned the expenses incurred by CTHP for adding, updating, and repairing the entrance way, kitchen, dressing rooms, wall paneling, side wings and chairs, furnace and ducting, historical displays, roof repairs, and painting. The Ontario Heritage designation was received in 1982 and plaques were affixed to the building. In 1992, along with a Government of Ontario grant of $16,000, CTHP funded and contracted the construction of the Green Room (lounge and actors waiting area) addition, which for the first time provided running water and indoor washroom facilities. This project included the pulling up and refinishing of the entire theatre flooring. In 2002, CTHP received a $23,000 Ontario Trillium grant for new lighting instruments, a computer-driven lighting system and console, and fire-proof stage curtains. In 2003, in anticipation of the eventual widening of Hwy 10 through the Village, the Ontario Ministry of Transportation, in cooperation with the Town of Caledon, contracted the moving of the Old Townhall 20 meters south and 40 meters east onto a new foundation complete with a full basement, a relocated kitchen, larger and improved dressing rooms, and additional washrooms. This improved facility is air conditioned and includes a lift for handicapped access to the basement from the main floor. In 2006, CTHP received a $9,800 Ontario Trillium grant to construct an outdoor storage shed for the stage walls (flats), doors, windows, and other miscellaneous items necessary for the construction of play sets. Apart from outside contractors (necessary for the professional engineering drawings, the digging of a foundation and the pouring of concrete), the actual planning and building of this shed was done entirely by volunteer members. The Town of Caledon replaced the roof and ceiling insulation in the summer of 2006. Our members are all unpaid volunteers, and are “governed” by a formal Constitution and By-laws. We have an elected executive comprised of a President, a VP Sales, a Treasurer, an Artistic Director, a Director of Advertising and Publicity, and a Secretary. Only a member may participate in our plays and we always welcome new members. We are a non-for-profit registered charity (#89066 9799 RR0001) and this website (www.caledontownhallplayers.com) contains information about the scheduling and pricing of our current year’s plays, how to contact us, and theatre news such as dinner theatre nights in partnership with Knox United Church. CTHP is a member ACT-CO (Association of Community Theatres of Central Ontario). We have submitted one or two plays most seasons for adjudication in competition with other member theatre groups. As a result of this, CTHP actors and production staff have been nominated for many THEA awards and received a number of awards as well — a recognition of which we are all extremely proud. We present three plays a year, as a subscription series. To give something back to the community which supports us, we offer three “charity nights” (two per play) to local charitable organizations for their fundraising. The six groups selected are allotted 50 tickets each for selling at the minimum of our ticket price, for which the group will remit $5 per ticket to CTHP to cover CTHP costs. On one occasion, one group requested 100 tickets for their own very successful night.